In my previous post I cited a statement made by a Frenchman Dupont about winged hussars and their beautiful horses. These horses were not for show or parade but for war, actually their stamina, strength, bravery and soundness essential to the winged hussar's battlefield performance. There aren't that many images of the old Polish Horses that have survived wars and burnings of Old Poland lands. Usually 3 or four are listed - and they are from the 18th century, sadly past the heyday of winged hussaria. 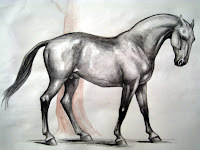 I started sketching this horse Sunday, and perhaps I will use this sketch :) although it will need saddle, shabraque, wings attached to the saddle etc. Soon I will post some more progress sketches.